This distinctive bird feeder offers features that will ensure birds in to visit stay. An unique design to protect from the elements of weather. 12 – L 15.00” W 9.50"
Stainless steel hardware will not rust. 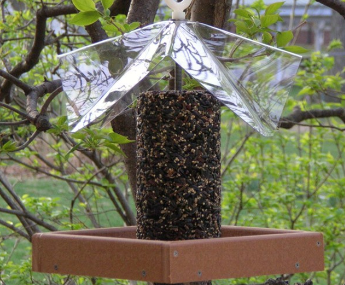 Clear cover protects seeds & birds from weather. Recycled Poly Lumber Tray is guaranteed not to crack, split, or fade!